The low-key Czech Village gathering, which drew a handful of neighbors, is among several commemorations being held this month in Cedar Rapids and across eastern Iowa to mark the one-year anniversary of flooding that deluged cities large and small, upending many lives and causing an estimated $10 billion worth of damage . Eighty-eight of Iowa’s 99 counties were declared a natural disaster area as a result of last year’s flooding and two deadly tornadoes. While progress has been made to recover from Iowa’s worst disaster, many frustrated homeowners still await government help to rebuild or buy and level their flood-damaged homes. Iowa has been allocated $798 million in federal block grant money that can be used for buyouts. But because of restrictive federal rules, only $24 million has been spent. State leaders hope the Department of Housing and Urban Development will grant their request to develop a “disaster track” that would temporarily ease restrictions so the money can reach residents and communities faster. 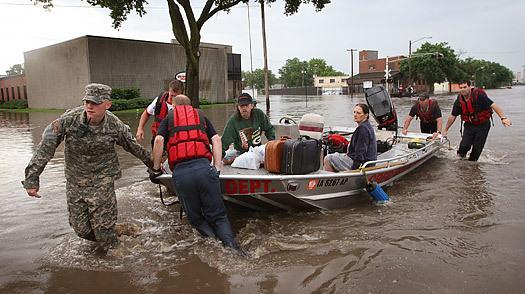 They’re also hopeful that Iowa will receive more overall federal and state disaster aid. To date, over $3 billion has been allocated, with $638 million spent. “It’s the timeliness of the money that frustrates us all,” says Lieut. General Ron Dardis, a former Iowa National Guard commander who is executive director of the state’s Rebuild Iowa Office, created soon after last June’s disaster. He also acknowledged the “huge gap” in overall aid vs. unmet needs but praised the Federal Government’s receptiveness.